One million records from a business database maintained by the Danish government were posted to the Internet Sunday by an unknown hacker. In a message posted to The Pirate Bay website, the hacker declared the records were being exposed on the Internet as a protest against the government using public funds to process the records in question, then charging the public to access them. The Danish records were available via a Bittorrent file and posted to the pirate website. The records were not remarkable when it comes to content; rather, they contain snapshots of Danish companies, according to the hacker. The database can be browsed at the government's Central Business Register website, but is "not available in bulk unless you purchase a license." The hacker said that the records were "obtained during the summer of 2011 by systematically harvesting data from the public parts of the [government] website." 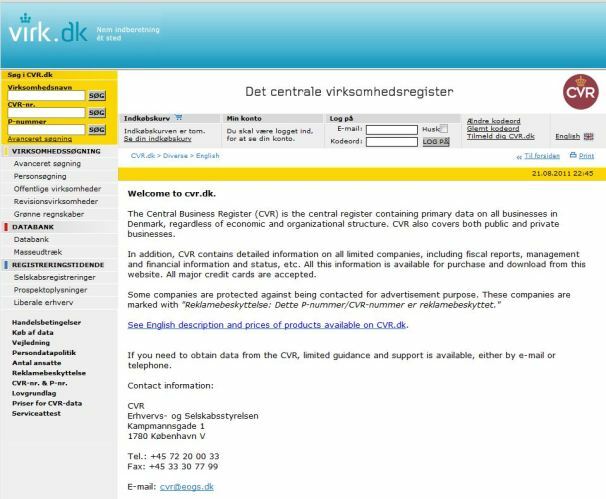 According to a translation of the website provided by the Danish government, the register contains primary data on all public and private businesses in Denmark, regardless of economic and organizational structure. "In addition," the website notes, "[the register] contains detailed information on all limited companies, including fiscal reports, management and financial information and status, etc. All this information is available for purchase and download from this website. All major credit cards are accepted." Although Danish authorities report that there are only 550,000 companies in Denmark, the hacker explained that the purloined database contains one million records because it also includes records of dissolved firms. "This data is made freely available because it is wrong for the Danish government to require citizens to provide data for government databases, then use taxpayer money to gather, collate and store that data, only to ask citizens to pay if they want access to that same information from the government," the hacker wrote. The Danish government hack comes a week after the hacktivist group known as Anonymous cracked into a website operated by the San Francisco Bay Area Rapid Transit (BART) system and released the confidential personal information of thousands of users of the public transportation provider. The attack was in protest of BART shutting off cell phone service in its downtown stations on August 11 to disrupt a planned protest over the shooting of 45-year-old man by a transit police officer.